The description of the IAP says something about 50% off until december. Anybody able to comment on the current IAP prices? And give recommendations about those packs? I would love for this to be AU. 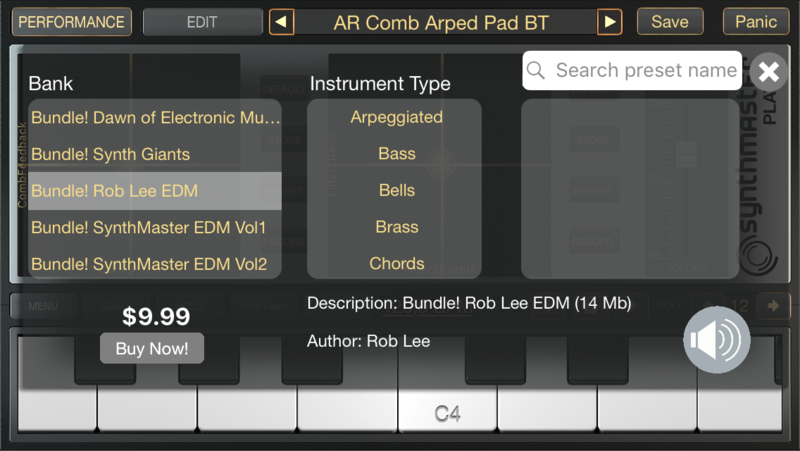 It was made to be, although rather frustratingly it hasn't been made to be... You can sample the sounds you like into a popular iOS sampler of course. So far as I can tell, they've been running a 'Black Friday Sale' on IAPs since last November, so perhaps not the most time-sensitive sale. Just saying. Also I wish you could turn off the arp globally. I'm reluctant to tell people what they like, so I won't do that. What I will say is that I rather like the Historic Synth Giants bundle (Vangelis especially) and the Dawn of Electronic Music Bundle. I may later get the two SynthMaster EDM bundles. AU version will come .... soon ... ! I hope so! For an app with so many useable sounds, it makes sense that users might want to use more than one on the same track. In the meantime, it plays very well with Loopy HD (or any looper I expect) and the 8 knobs per preset setup works great with a nanokey studio (or any 8+ knobbed controller I imagine). I hope they let you save your arp on/off choices in future, for the user presets at least. It's weird and irritating that they're always on. yeah what ever happened to synthmaster one? I'm waiting on that one too. It was supposed to be out already but something has definitely held things up and damned if I can find out what held it up or for how long. Anyone else having issues with SYnthmaster not opening correctly? Then it duplicated in menu. I found the top one is the one that works in the slot. The Rob Lee EDM bundle was like total $24 if purchased separately and $20 reg bundle price, so it is definitely at 50% off sale price. Do you guys recommend Poison 202 or the Rob Lee pack? Same price. Reminder - if you have desktop version, purchase there and transfer to iOS, doesn’t work the other way round. I would get Poison, when you don't have some other AU Synth. Poison-202 is a great synth. poison for more control over sound. but synthmaster one whenever it finally comes out.